Tires wear out driving down the road, but they last for years in a landfill. We make every effort to reuse or recycle used tires giving new life to old rubber. Whether they are used in the manufacture of retread tires or as rubber in a host of new products, they are not in a landfill, which is good news for everyone. Call Mr. Junk at 678-Mr-Junk1 or schedule a pickup online. We can be there same day and at a time that’s convenient for you. Doing the right thing has never been so easy! We even follow-up to ensure your satisfaction. Mr. 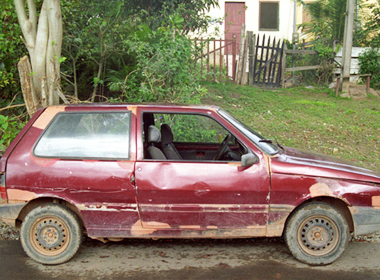 Junk also provides fast, no-hassle removal of unwanted, broken or junk vehicles. It may be a car in your driveway or one that has been rusting in your yard for years, Mr. Junk can get rid of that eyesore fast. In fact, nobody does a better job of hauling away old, worn-out and unwanted vehicles in the Atlanta metro area. How much does this excellent service cost? Nothing! We actually PAY YOU top salvage value for your car! If you have old car parts, rusted lawn furniture, basketball goal posts or anything else metal, call Mr. Junk. These items can be heavy and difficult to remove from your property, but one call to Mr. Junk and your problem is solved all in the same day.